Staff photo by Erin O. Smith / Democrat Phil Bredesen speaks about his stance on health care during an ideas forum Monday, October 1, 2018 at the Bessie Smith Cultural Center in Chattanooga, Tennessee. Bredesen held the event to talk about his platform and field audience questions. Bredesen is running against Republican candidate Marsha Blackburn for the U.S. Senate seat that will be available when Sen. Bob Corker leaves his position. Phil Bredesen never raised his voice or dropped his relaxed demeanor but still managed to land some sharp blows Monday night on his opponent in Tennessee's U.S. Senate race. It started nearly as soon as the mics went on in the Bessie Smith Cultural Center, where the seats were packed and folks leaned on the walls for the one-hour "Choose Chattanooga" Ideas Forum. Democrat Bredesen pointed out his Republican opponent, U.S. Rep. Marsha Blackburn, "blew off" two debates and skipped Chattanooga in favor of a $10,000-per-couple fundraiser and a rally with President Donald Trump in Johnson City, Tennessee, on Monday night. The former Nashville mayor and two-term Tennessee governor said this is one campaign where the choice between the candidates is clear. "This is not a Tweedledum and Tweedledee election. 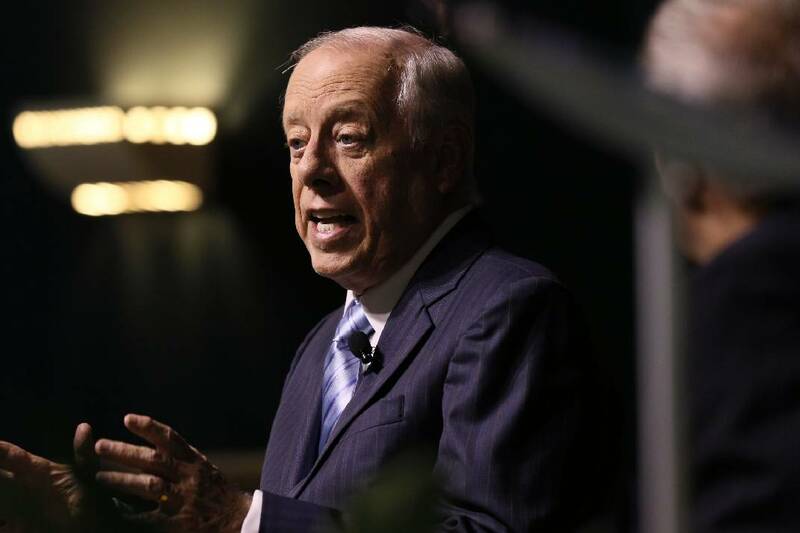 We have very different conceptions of what the job is and how it works, and that's good," Bredesen said. Sitting in a chair on the stage with moderator Garry Mac, Bredesen took questions submitted by people in the audience or on Twitter about health care, the opioid crisis, the need to get broadband internet into the state's rural counties and how to bring more and better jobs for Tennessee families. "I believe in compromise, picking and choosing from all parts of the political spectrum," said Bredesen. "We've got to stop messing around the edges of things and tackle them. And to do that, it's got be bipartisan." That was one of numerous applause lines for the crowd. In contrast, he said, Blackburn has spent 16 years in Congress as "a very hard-nosed partisan — draw lines in the sand, make no compromises, take no prisoners. She's good at it and that's something that some people want." Blackburn is firmly in Trump's corner. This was Trump's second visit to Tennessee to support her — Monday night he called her a "true fighter" — and Vice President Mike Pence also has come to campaign for her twice. Bredesen used audience questions to keep highlighting the differences between himself and Blackburn. Asked if Chattanooga's EPB could be helpful in Bredesen's push to get the Tennessee Valley Authority to take on responsibility for getting broadband internet into rural areas, he said TVA "would be insane not to immediately go to the Electric Power Board" and ask for its help. But when EPB got the OK from the Federal Communications Commission to supply broadband in Bradley County at the county's request, he said, "Blackburn wrote to the FCC and got them to tell EPB to stop doing that. Actions speak louder than words." That drew a "boo" from the audience at Blackburn. Their second and last "boo," though, was at Bredesen, over a question of how he would handle the Brett Kavanaugh nomination to the U.S. Supreme Court. Bredesen called the Senate spectacle over Kavanaugh's nomination embarrassing for both parties but wouldn't say how he would vote before the FBI finishes its investigation. The audience was palpably unsatisfied with the answer. Blackburn has said she supports Kavanaugh, The Associated Press reported. Campaign spokeswoman Abbi Sigler said in a campaign statement that Bredesen, "After 84 days still has not given Tennesseans an answer on Judge Brett Kavanaugh's nomination. He continues to say he's 'applying for the job,' but he's leaving the application blank." Asked about health care and the opioid crisis, Bredesen told a Marine veteran the state of the Department of Veterans Affairs is "unconscionable" and there is a "huge, huge gap in terms of making people have access" to medical and mental health treatment. He said 225,000 Tennesseans depend on the Affordable Care Act for their health insurance, "and I'm running against somebody who goes around bragging about" how many times she voted against it in Congress. "I don't think you should treat Tennesseans that way, and I don't understand how you could do it," he said. When an audience member asked to heal the partisan divide in Washington, Bredesen got a big round of applause when he replied, "First of all, you should elect someone who wants to do that." "I hope it comes through to you — I still have a very high school-civics view of my country," he said. "We have a brilliantly designed government and it pains me to see me what it's become over the last 15 years. I'd like to be an agent of change."